I haven’t gotten my farm-work fix often enough lately. 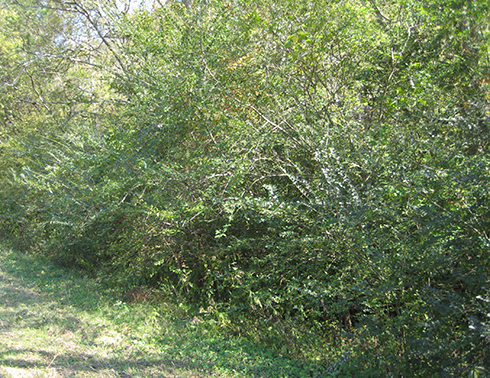 Autumn is the best time for outdoor work in Tennessee, but last autumn I was dealing with a bone spur and torn bicep. Then I spent months recovering from the surgery and getting my strength back. 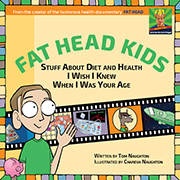 Then I was swamped with all the work required to get the Fat Head Kids film finished and off to the distributor. Then I was swamped writing and preparing my updated speech on Diet, Health and the Wisdom of Crowds. 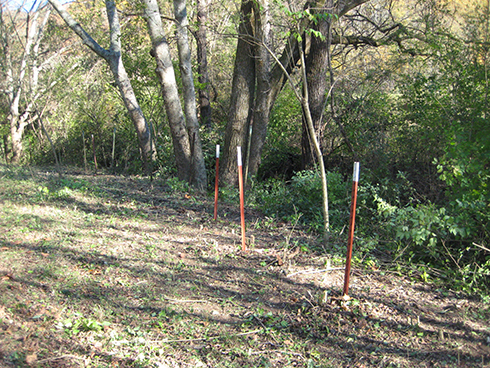 That got us thinking: use those t-posts as the starting point for a fence enclosing the entire back of the property, and the dogs would have a huge space to run around. Well, the dogs are seven years old now. If we don’t build the fence soon, they’ll be too old to enjoy the freedom. Currently, the dogs only have access to the back yard. 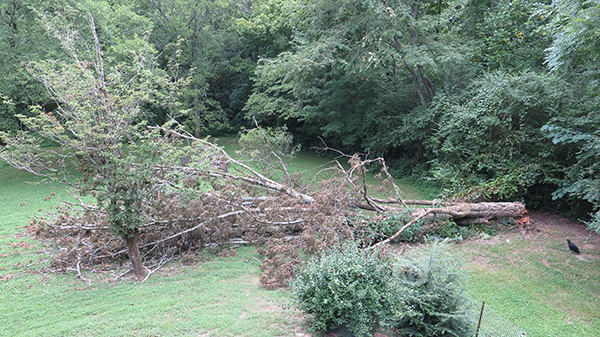 They used to have access to a big side yard as well, but when this big ol’ tree fell down, it obliterated the side-yard fence. Yes, cutting the tree into firewood is on my to-do list, but that’s a project all by itself. 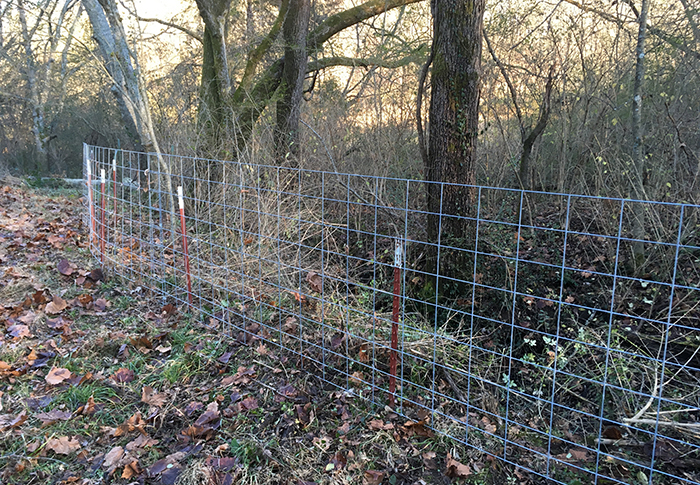 We decided it’s more important to finally fence in the entire back of the property. 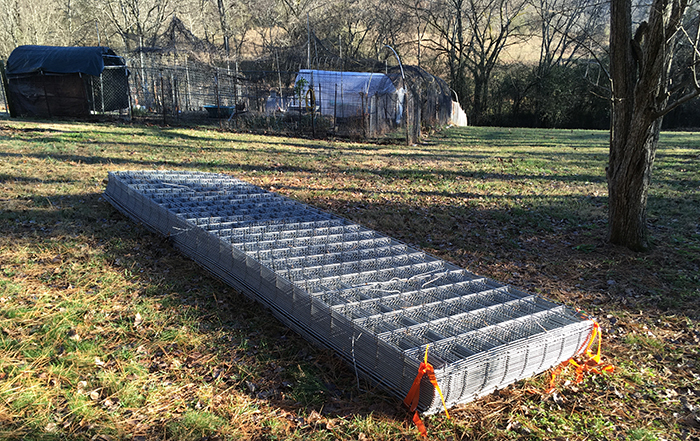 So just before Christmas, Chareva ordered 50 cattle panels and a bunch of t-posts. I know from experience that the most important part of any big project is getting started: writing the first page of a book, writing the first block of code for a software project, selecting the first bit of footage and dropping it onto the timeline for a film, etc. Getting started takes The Big Idea and turns it into The Actual Thing. It’s easy to keep pushing The Big Idea into the future, but once The Actual Thing exists, it demands to be finished. At least that’s how it works for me. That danged jungle I cleared years ago keeps trying to grow back, so I had to begin by taking The Beast around the area for a feeding. By the time I was done with that, the sun was threatening the slip behind the hills. Yes, I’d gotten started, but The Actual Thing was nowhere to be seen. I told Chareva I’d like to at least get two of the cattle panels fastened to t-posts before we quit for the day, so we did. Bingo. The Big Idea was now The Actual Thing. The next weekend was more about making way for the fence than putting it up. 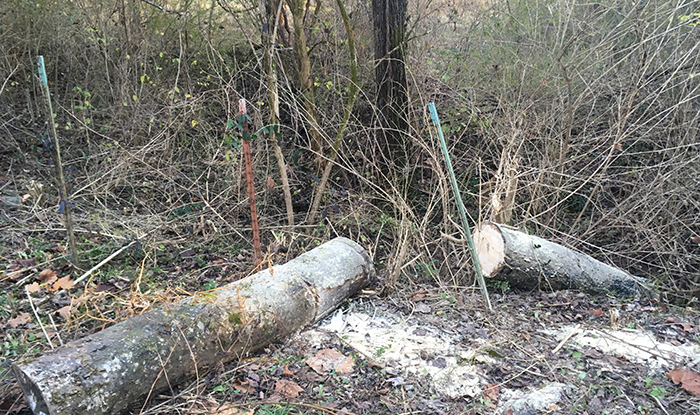 There were spindly trees growing along the line of t-posts, so I had to get out the chainsaw and knock those down. There was also the remaining trunk of a big ol’ tree that fell down a couple of years ago. I’d already cut most of the tree into firewood, but had stopped when it was clear of where the lawn service cuts the grass. 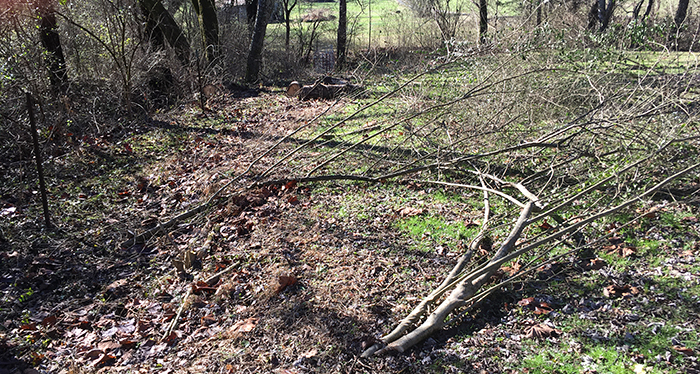 Well, the remaining trunk sat right across the fence line, so I got out the Farm Boss chainsaw and cut the rest into chunks. As I finished cutting the trunk apart and heaving the chunks out of the way, I felt myself running out of gas. What? I can’t be exhausted already! I do work like this all the time! Uh … well, that used to be true. But I don’t spend five-hour sessions pushing a lawn mower up and down the hills anymore. I haven’t been pounding in t-posts, hauling away heavy branches, or doing heavy-duty work around the farm for more than a year, except sporadically. Sure, I’m back to working out at the gym, but I was reminded of what Dr. Doug McGuff wrote in Body By Science: all fitness (even so-called “cardiovascular fitness”) is muscle fitness, and it’s fairly specific. 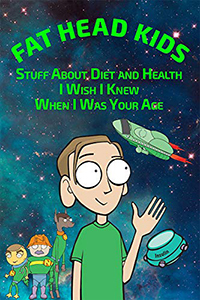 He recounts the story of two guys who assumed they’d pass a fitness test on a bicycle because they were avid runners. But they didn’t … because running doesn’t work the same muscles in the same way as riding a bike. Meanwhile, their previously inactive colleague passed the bicycle fitness test because two weeks ahead of the test, he began training daily on a stationary cycle. I’m in good shape for a 60-year-old guy, but I’m not in farm-work shape. Not like before. The only cure is to do more farm work. 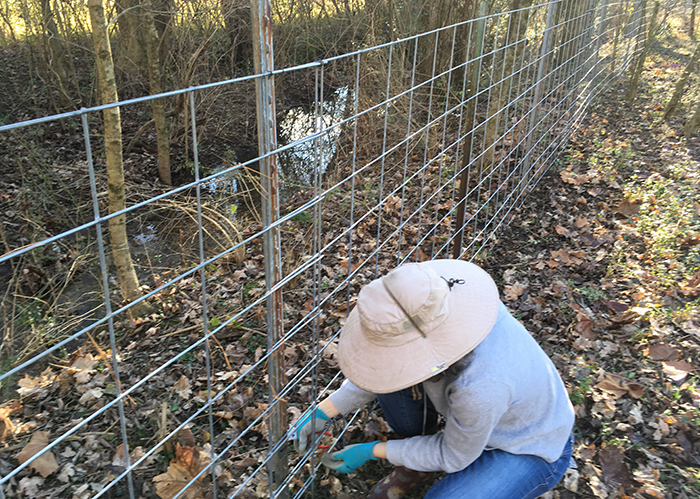 Chareva and I both dragged cattle panels from the stack to the fencing line, then I held the panels in place while she wrapped them to the posts with wire. 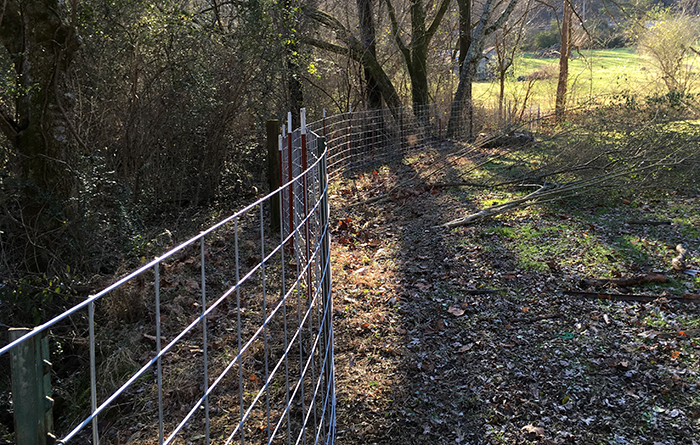 After our Saturday and Sunday sessions, we had a fence that stretched two-thirds of the way along the length of the field. Man, it felt good to be out there doing manual labor. The weather report for the upcoming weekend is cold and rainy, so we probably won’t be working. 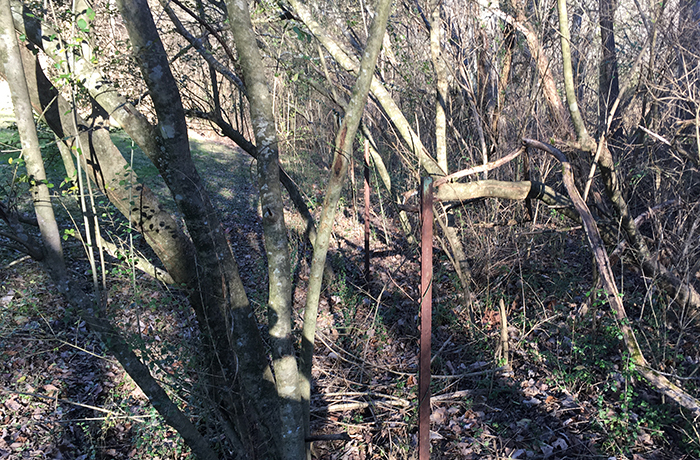 When the weather cooperates again, the first job will be to get out the chainsaws and take down more spindly (and some not-so-spindly) trees that have grown into the existing line of t-posts. I’m looking forward to the labor … and to getting back into farm-work shape. Meanwhile, the farm has been productive without my participation. Thanks to the lingering warm weather, Chareva’s garden is still giving us kale and collard greens. 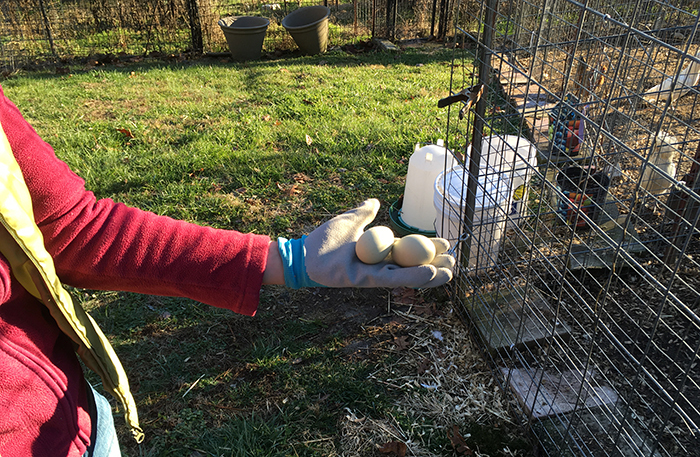 The even better news is that after months of buying eggs at Kroger (thanks to Rocky Raccoon VIII wiping out the previous flock), the new chickens have finally started producing eggs. We have three breeds of egg-layers in the new flock. The most interesting are the Polish Top Hats. When they strut around shaking that mop of feathers atop their heads, they remind me of a big-hair band from the 1980s. You may have noticed the pumpkins. 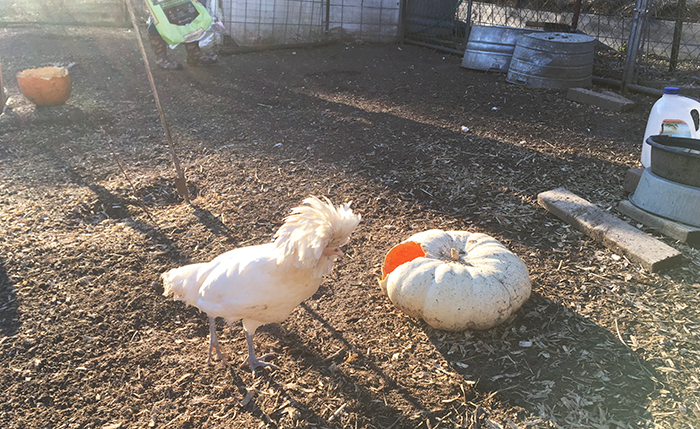 When Halloween came and went, Chareva posted a note on a local message board that we’d happily take any leftover pumpkins as chicken food. Just drop them off next to our roadside egg-stand. We now have quite a supply, and the chickens seem to like them. Better than just throwing them away.